I have always stressed that you should focus only a few programs when developing and maintaining a loyalty rewards program portfolio. Since I posted our first ever article on Maximizing the Miles and Points you earn, back in 2005 I advised that you should only focus on one airline, one hotel and/or one shopping (credit card) program. To this day this still holds true for the vast majority of Canadians. Although I have now been telling some people that it is better to diversify and spread you earning and rewards out, this more so for people who are frequent travellers earning tens of thousands of miles or very high credit card spenders putting five figures on their cards each month. The reason for diversification is to shield yourself from program devaluations, why put all your eggs into one or two baskets only to have those baskets lose value over time. No matter what, the sooner you can use your rewards the more value you'll get out of them. However for many Canadians that read this site it isn't physically possible to collect enough miles in 2 or 3 airline programs, points in 2 or 3 hotel programs and multiple shopping programs to make it worthwhile. However in that article I do state that it doesn't hurt to join other programs and collect points or miles in them as one day you may be able to use them. I like to call them secondary programs for your loyalty program portfolio. For me one of these secondary programs has been the well known coalition program, AIR MILES. After a big redemption of miles for flights in 2011 the balance in my account dwindled to 330 miles and it took me until the end of August of 2014 to make that balance grow to 1,000 miles. By December of 2014 that balance had grown to three fold to 3,000 miles! So how did this happen, it took three years to earn 670 miles but only four months to add 2,000 more miles? As much as I would love to be earning Aeroplan miles on all my shopping, I am not going to go out of my way to earn them unless it is an amazing promotion and unfortunately Aeroplan doesn't have any grocery or drug store partners anymore anyways! So the solution is to use a secondary program of mine to make sure I am being rewarded on those purchases. In fact, not only is it with these retailers and Air Miles, but I will always see if I can be rewarded for any and all of my shopping. 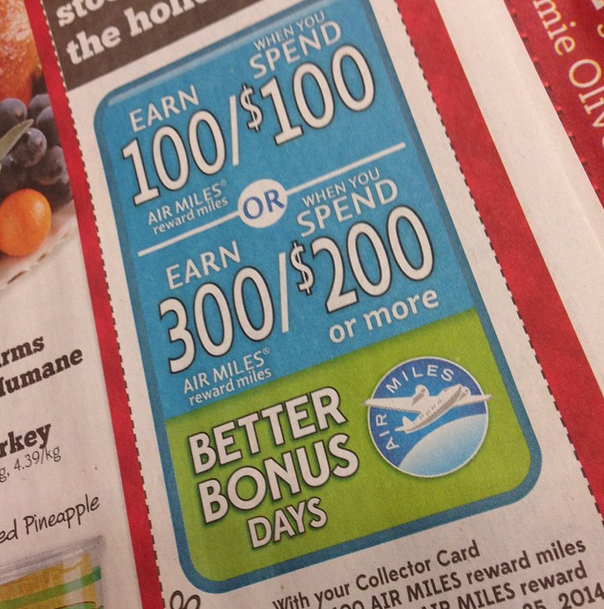 Earning Stories: 540 AIR MILES Rewards Miles for buying Gift Cards at Safewaypost which details the bonuses earned. So there you have you it, even though the primaries in my loyalty program portfolio are Aeroplan, American Express Membership Rewards, British Airways Executive Club, Diners Club Club Rewards and Starwood Preferred Guest you can see how a matter of convenience and bonus offers have quickly boosted the balance in one of my secondary programs and where in the summer of 2014 I didn't have enough miles for a short haul flight, I now have enough miles for two short haul flights with some extra miles to boot. Are you making use of 'secondary' programs in your loyalty program portfolio or do you strictly stick to only a few primary programs? Tell us your stories below! My AMEX Membership Rewards card is my primary card and my BMO Air Miles is my secondary, so I do accumulate a fair number of Air Miles. I took advantage of the last Safeway program to get 500 Air Miles. Aeroplan is my primary airline program by far but I am a member in Westjet and United to get the trickle of points when I do fly those airlines. What do you value Air Miles at? I always figure around a dime per point based on what you can redeem them for. Makes sense, but also highlights that your previous ability to early Aeroplan miles at drug and groceries stores was a bit of an anomaly. In most Canadian communities (including here in Ottawa), Aeroplan has never had any grocery or drug store partners. We don't have Sobey's, and Rexall's partner here in Ontario has been AirMiles for years, likely over a decade. Unfortunately regional issues do arise, definitely easier to earn Air Miles in Ontario when shopping (LCBO, Rexall etc) and such is the case now out West here! 10 cents is a good valuation, not too high, not too low. I was just comparing purchasing a ticket on Air Canada and via Air Miles and the value of the Air Miles were at 13 cents. It all depends on what you redeem for and when. The 10 cents is nice and conservative and when you redeem you shouldn't be disappointed if you are a numbers guy as there is a good chance the value will be higher than that. As soon as I have 950 Air Miles, I "cash in" for $100 off my grocery bill, then I make sure to put $100 into my dedicated "travel" bank account right away. This way, when I decide to take a trip, I have at least some of the money put away, and I can travel with any airline, anytime, and take advantage of seat sales, etc. Just to clarify, Air Miles (AM) will not be a Sobeys program until the end of March in Ontario and Quebec, where it remains a Metro program until then. (It is unlikely both Metro and Sobeys will be AM partners, so big question here is who it will affiliate with.) We've never had as generous bonus miles promotions here in central Canada as offered by Safeway/Sobeys out west, though Rexall/PharmaPlus has regular 20x or 50 AM bonuses after a spend of $50+. (But no AMs on prescriptions in Ontario...just on our booze at the LCBO, go figure?!) However, with the move from AE and its own Club Sobeys program(s) to AM, Sobeys is offering some generous AM bonuses: 50 AMs for registering your AM account with them, and 500 AMs for changing from a BMO Club Sobeys MasterCard to a Sobeys AM MasterCard. I've used my AMs quite often for short-haul flights between YYZ and ORD/JFK/BOS mainly on AA. Note that with a Gold BMO AM MasterCard, one gets a 25% discount on these flight redemptions (not sure if there will be a similar discount with the new Sobeys AM MasterCard which I believe is just available as a basic, non-premium version). Fees on these tickets are a bit higher than with domestic AC flights using Aeroplan miles. Patrick, I look forward to reading your newsletter. I rely on it as my major source of information on promotions. I hadn't thought of checking the flyer as I enter Sobeys. Now I will. I'm wondering why you haven't mentioned applying for the AMEX Air Miles Platinum. I applied on referral for the 1600-point sign-up bonus that recently increased to 2,000. That's a nice boost for an easily attained minimum spend of $500. Keep up the good work. That is a great way to take advantage of the program and yet not be stuck with their travel restrictions! Works for us, but does require discipline - and of course we have to have the $100 available for the bank transfer each time. And note that "us" - I am not sure if this is still possible, but hubby and I merged our two Air Miles accounts many years ago - all of our points accumulate in a single account, so much faster. Yes you can still merge accounts and I encourage all families to do so!